I have a 10Hp 4 cycle kicker to mount on my 25ft sailboat. The motor I have is a extra long shaft. While I know I can't mount this directly to my transom, I don't like the adjustable motor bracket designs much. I am wondering if I could mount it to a fixed bracket? The adjustables look rather weak and I am not certain I need it to be adjustable as the motor itself has a tilt. What am I missing? with the adjustables the motor can stay flat against hull rather then sticking out at an angle.... or you can make a solid mount if thats the way you want to go..
Stuart; Maybe a pic of the transom as it is now would give us an idea of how to suggest a design? Here is a picture of the transom with the rudder. Here is another picture of the tansom upside down. Picture of the motor. Its a heavy motor too. 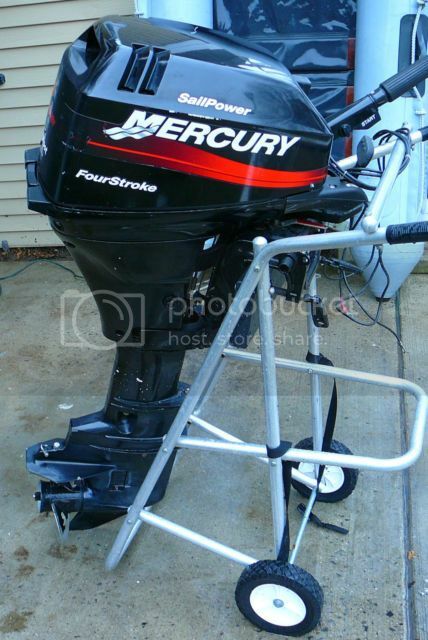 For the motor you have it would need a wider base to distribute the loads more across the transom. Obviously needs some playing around with mock-ups to get the right shape and size/location, staying clear of the rudder. I'd probably go with stainless but the cost would be higher. Well I'm still confused. The Garelic from Internetoutboards indicated use on 2 stroke engines only. Mine is a 4 stroke and I thought this was the right way to go. Maybe not? The fixed braket from Norfolk Marine is up to 4hp and mine is 9.9 hp. Once again I thought using anything less on a 25ft sailboat would be unsuitable. Maybe not? I'm thinkin Jack Plate. Whats the reasoning on that? Could I make one?